There are ample of smart devices available on the market that transforms your house into a smart home. So if you own multiple smart home devices then you will need more than one smart plugs. 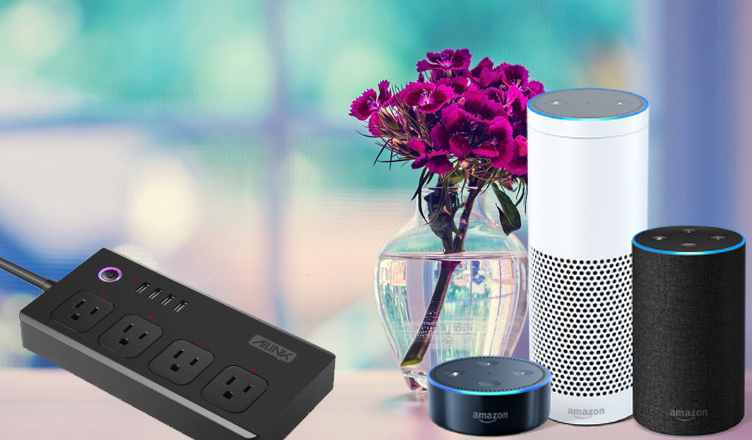 But if you don’t want to purchase multiple smart plugs then you can go through this list of best Alexa compatible smart power strips which provides surge protection too. This top-rated surge protected Alexa controlled smart WiFi power strip comprises of many power outlets and USB ports. You can easily provide power supply to all the attached devices through this power strip. In turn, you can control the power strip with your voice as it is Alexa-enabled. You can even set schedules so that it automatically powers up your devices whether you are around or not. Isn’t this an interesting product? Well, explore this list of smart power strips that work with Alexa. The Wi-Fi enabled power strip from Weton provides you the facility to control each of the outlets individually with your voice. You can turn on/off the devices as per the schedule you set in order save energy. Equipped with 4 AC outlets and 4 USB ports, this strip lets you connect eight devices at a time. You can supply power to your laptop or tablets while remotely controlling the fans, lights, heaters, and other appliances simultaneously. It is thus an ideal one to carry while traveling. You can now control your home appliances right from your smartphone. The LITEdge power strip from Torchstar can control all your electronic appliances attached to it with just a single tap on the Smart Life or LITEdge app. You can even schedule the power strip according to your needs. This enables it to juice up your connected devices automatically – whether you are present at home or not. Built from high quality of fireproof materials, it offers safe usage for everyday living environments. Iron-M brings to you a Wi-Fi controlled power strip which is equipped with 4 power outlets and 4 USB ports. You can now meet your daily needs be it at your house or your office. What you require to do is connect it to your Wi-Fi connection and then you can operate it from your smartphone. It also facilitates you to sync it with Alexa so that you can make use of voice control functionality. It lets you handle the devices plugged into the outlets individually. But the devices attached to the ports can be controlled together. Control the power supply of the devices connected to the power strip now with your voice. It works with Alexa as well as Google Assistant only after you install the Jinvoo smart app. Once you connect this power strip from Conico with the Wi-Fi network, you can remotely have full access to control the devices right from your smartphone. Further, it supports Surge Protection i.e. it effectively absorbs high voltage and safeguards the connected devices from getting damaged. The smart power strips for Amazon Echo from Ailink facilitates voice control feature. You can name each outlet and control it independently. You can ask Alexa to turn on/off specific devices without affecting other devices’ operation. It comes with a timing function that enables you to set different schedules. Set the schedule that the power strip automatically turns on/off the devices; hence saving energy and your electricity bills. Charge multiple devices from a single electrical socket and enjoy a smart life experience. While moving further on our list of best Alexa compatible power strips next is the one from KEDSUM. Equipped with 4 AC outlets, you can easily supply power to your attached home appliances like fans, lights, heaters, water dispenser, TV, decorating lights, and many more. You can even set different schedules. Suppose, you can schedule the fan in such a way that it automatically turns on as you enter your room. You can even sync your house lights with sunrise or sunset. You can control all the four outlets either individually or at the same time. This power strip from Amtake offers you with a great way to start home automation. It comes with an inbuilt Wi-Fi compatibility. Thus, you don’t require any hub for this power strip to function. There are 4 power outlets and 4 USB ports on this power strip. You can handle the outlets individually if you want but the USB ports are group controlled i.e. you can’t control them individually. Featuring Surge Protection, it keeps all your connected devices safe from overvoltage and other charging damages. The Alexa enabled power strip from mengyasi works with your Amazon Alexa Echo. it enables you to manage your home appliances directly from your smartphone or tablet from wherever you are. What you require to do is plug a device into this strip, connect it to your Wi-Fi connection, download a free App, and then plunge into the experience of a smart life. Use full control mode or control each of the 4 sockets individually with its remotely wireless control. One of the well-known appliances manufacturers is ZeroLemon and it never compromises with its product’s quality. This Wi-Fi controlled power strip works with your Amazon Alexa, Echo Dot, and Google Assistant for voice control. Built with Multi Protection system, it protects all your plugged in devices from overcharging, overvoltage and all the unexpected damages caused due to charging issues. You get 12 months of the warranty period on the purchase of this Smart Socket from ZeroLemon. Equipped with 4 AC outlets and 4 USB ports, this power strip from Kisslink lets you access voice control functionality of Amazon Echo. It is compact in design, light in weight, and its portable design makes it easy for you to carry it anywhere. It supports both separate as well as remote control. Use individual control or full control mode whichever is preferable to you. You can make use of timer function by setting different schedules with the help of the App on your smartphone. Which of the above listed some of the best Alexa compatible power strips would you buy? Do write to us about your choices and opinions in the comments section.